The days are getting longer, the weather is getting warmer, and summer is just around the corner. With more than 700,000 couples getting married between May and September each year, summer is the unofficial season for weddings. Despite the number of couples who choose to get married in the summer, it is surprisingly simple to create personalized wedding decor. Creative wedding chair decorations are an easy, eye-catching way to customize any wedding ceremony or reception in a variety of ways. We have compiled a few of our favorite fun and unique wedding chair decorations for a summer wedding. Sashes are a popular way to decorate wedding chairs, but that doesn’t mean they have to be boring or unoriginal. They can be made from practically any fabric to fit the wedding theme. Crisp, shimmering satin is the perfect finishing element for an elegant, formal affair. A tulle or ruffled sash will have an air of timeless romanticism while light, flowing organza can add a touch of whimsy. Whether using one, two, or a whole rainbow of colors, sashes can customize wedding chairs to a variety of colors and theme. Tying them in a unique way, such as an oversized or sideways bow, is a simple way to add an extra personal touch. 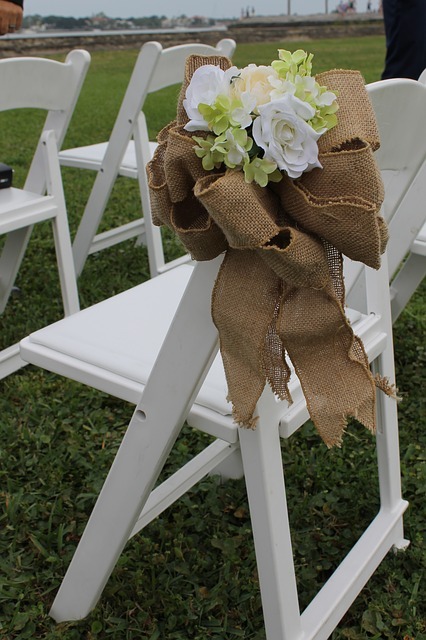 A sash can be tied over a chair cover or to the chair itself. For a truly unique look, rather than tying the sash, consider weaving the fabric through the back of a Chiavari chair. For couples that want to decorate every chair, not just the aisle seats, but want something different than sashes, wreaths are a wonderful option. At once whimsical and romantic, wreaths can be made in multiple varieties, with or without flowers. If the bridal bouquet includes a pop of color, it can be fun to echo that with small flowers of a similar hue on the chairs. 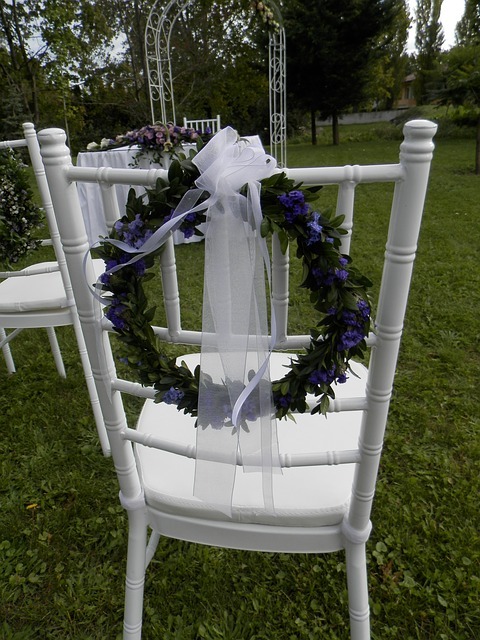 While a wreath can be placed on the back of any type of chair, they look particularly beautiful on our Chiavari chairs. 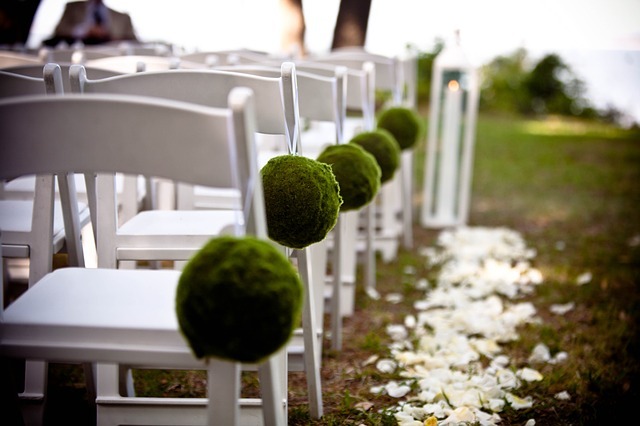 Textured moss spheres add a beautiful natural element to the aisle and are perfect for simple outdoor or rustic ceremonies. Since the moss is attached to foam floral balls, they are easily customizable. Add small, delicate blooms or other greenery for a personal touch and understated elegance. These wedding chair decorations are also surprisingly lightweight, making them perfect for classic outdoor wedding folding chairs. Dangling bouquets provide the beauty of flowers without the added weight of a vase. As a result, they are easier to hang directly from the chair than flowers in a vase. The use of a shepherd’s hook may still be a good idea depending on the weight of the chair and the bouquet itself. For example, our sturdy premium banquet chairs would be able to hold most bouquets unassisted but may not be ideal for outdoor venues. 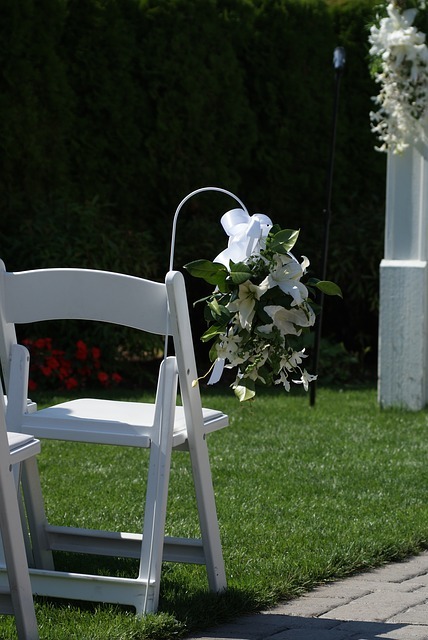 Our lightweight wood or resin folding wedding chairs are outdoor favorites, but would benefit from the use of a shepherd’s hook to secure the bouquet. A small bouquet of flowers inside a large decorative bow combines the best of both worlds in wedding chair decorations. The fabric choice will mirror the wedding theme while the flowers add a touch of natural beauty. Beautiful, pale blooms pop against a burlap bow in this example, but richly colored fabrics or flowers would be beautiful for a more formal affair. Since these types of decorations are generally affixed directly to the chair with wire, they work best with folding chairs or Chiavari chairs, as opposed to banquet chairs, regardless of venue. Versatile mason jars can be filled with water or stones and used as a vase. Any flowers or greenery can be used, but since mason jars have a wide mouth, if you are using a single stemmed flower, stones in the bottom can be used to hold it in place. A simple ribbon around the top adds a finishing touch. If the wedding theme is more rustic, substitute twine or a thin strip of burlap for the ribbon. For evening or sunset weddings consider using small LED tealight candles in the place of flowers in the mason jar for simple hanging lights along the aisle. 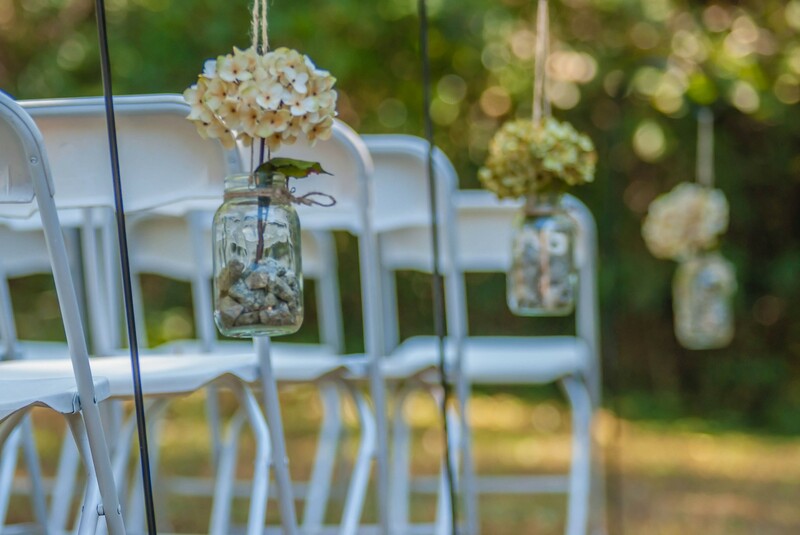 Mason jars may be a bit heavy to attach directly to most chairs, depending on the size of the decoration. In these instances, using a small shepherd’s hook alongside the chair may be advisable. While not directly attached to the wedding chairs, large bouquets of long-stemmed, large blooming flowers in heavy vases are a great way to bring the beauty of summer to the aisle. Sunflowers, in particular, evoke the essence of summer and brighten spaces, both indoors and out, that may be lacking in natural color. 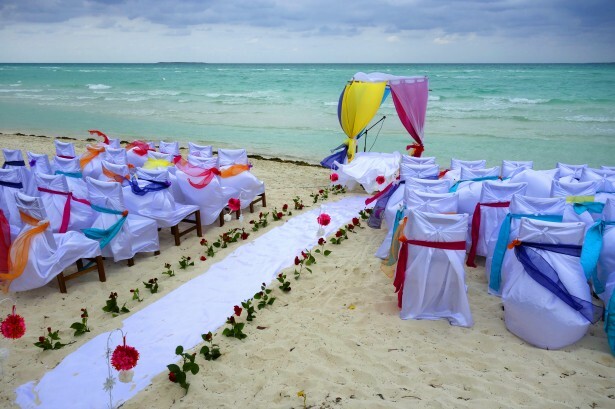 Since the wedding chairs serve as location markers, rather than physical holders of these particular decorations, any type of chair will work. Wedding chair decorations may seem like a small piece of wedding day decor — fun and creative wedding chair decorations, however, can provide the perfect, personalized finishing touches to any ceremony.